It is also the home of HFIAW Local 119 Saskatchewan, as well as our state-of-the-art Canadian training centre and apprenticeship program. With the support of LMCT, in the spring of 2017, Local 119 launched a government relations program with the provincial government of Saskatchewan. The goal of the program was to make elected officials and bureaucrats aware of the amazing work of Insulators in the province. In a year-end interview in 2016, Premier Brad Wall said, “…everything must be on the table,” noting that this includes looking at both revenue opportunities and expenditure reductions. Local 119 talked to its members, looked at a number of government-owned buildings where we had previously completed work and decided there were extensive opportunities across Saskatchewan and particularly in government buildings for “shovel-ready” projects that will greatly increase energy efficiency, while creating apprenticeship and training opportunities within our skilled trade. Local 119 started its push by writing to several Ministers of the Crown and senior bureaucrats with a request to meet. In our meetings, we pointed out that investing in mechanical insulation is a simple idea that will build capacity in Saskatchewan’s skilled workforce, while generating savings for both the public and private sector. This will, in turn, increase the productivity and competitiveness of the Saskatchewan economy. The Government agreed and, after a few months of negotiations with the provincial government, we were asked to audit the Wascana Powerhouse. Local 119 reached out to HFIAW Local 118 in British Columbia to lean on their expertise and the success of their thermographic enterprise Salamandar Inspections Ltd.
Salamander Inspections Ltd. is a third-party inspection service providing energy audits for mechanical systems in the commercial/institutional sector. 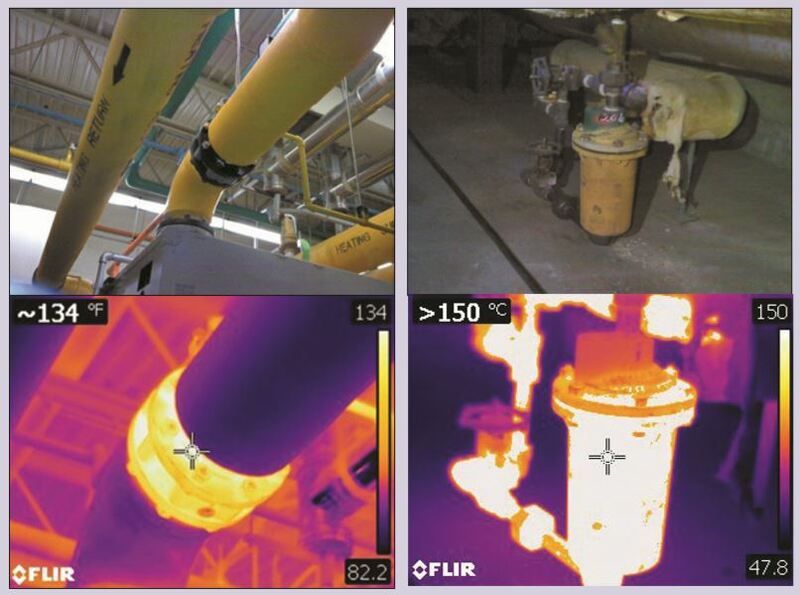 Salamander uses a state-of-the-art FLIR thermographic camera to provide clients with accurate measurements and photographs of heat loss and gain on mechanical systems. The brighter the color, the hotter the temperature of the object. The camera must be set up to filter out the ambient heat from surrounding objects to ensure that the temperatures are accurate. The camera then takes a thermal image as well as a digital picture for reference. Salamander Inspections Ltd. in partnership with Local 119 Insulator members performed an energy audit of the insulation systems within the main powerhouse building, its boiler rooms and utility tunnels to all connected buildings. The purpose of the audit was to determine the current state of mechanical insulation applied to the systems. One of the most interesting conversations we had during the audit was about the impact insulation has on improving safety at the work site. It turns out the Saskatchewan Government has used the Wascana Powerhouse as a living lab for local high school students. The province arranged for students from schools across the Prairie South School Division enrolled in a power engineering course, as well as local power personnel and local politicians to tour the plant to supplement their in-class learning. Local employees at the plant were shocked to discover the danger at their fingertips due to uninsulated or poorly insulated equipment. We were able to point out on site with our photos and equipment that mechanical insulation is a component of a comprehensive safety program: Insulation protects workers from contact with hot or cold surfaces. Acoustic insulation protects workers from excessive noise levels generated by mechanical systems and grease duct insulation and firestop, are additional examples of how insulation is a vital component of building safety. That upgrades to the Wascana Powerhouse are put out to tender – we are happy to compete for the work with other qualified bidders. That government public works departments create separate, fully costed bid packages for green upgrades and mechanical insulation in all their procurement strategies for real property to ensure the project manager is not forced to choose between efficiency and cost.